Athena doesn’t have only her noble froggy steed to keep her company — when times get tough, she has a veritable menagerie of creatures on which to rely! Here we have a friendly dumbo octopus that appears to lend a helping hand (or tentacle) by occasionally lunging at enemies in your path. Hope everyone’s having a good week! We’re gearing up to present a 30-second gameplay video at the end of the month, and while we do so I thought it’d be fun to share some snippets of how the game is going to actually look. Whoa. Good thing I’m sitting down for this. Seeing things come together like this can be quite cathartic. 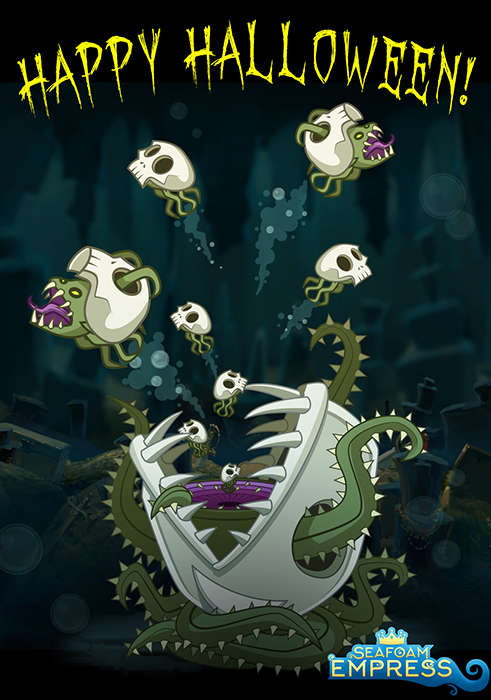 Also, are the pirate golems running on water? How messianic! The giant crab aggressively guards his treasure, but really the only thing Athena wants is that golden tooth, right? Today we’re featuring one of the more peculiar enemies in Seafoam Empress (although, to be fair, they’re all pretty damn weird). This little guy’s design developed as a cross between a pirate, a knight, and a wooden golem. And to make him extra cool his claws can rotate like propellers. So I guess I threw Inspector Gadget into the mix as well. 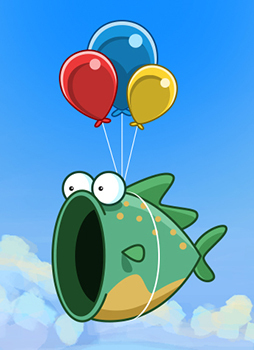 This fellow’s purpose is to float around and look rather disturbing. So not too different from me in this sense. I compiled a GIF showing off the rather large ensemble of characters in Seafoam Empress. As you can see it’s a rather diverse (and bizarre) selection. A veritable phantasmagoria of curious creatures, most of whom are hellbent on killing our grossly outnumbered heroine. 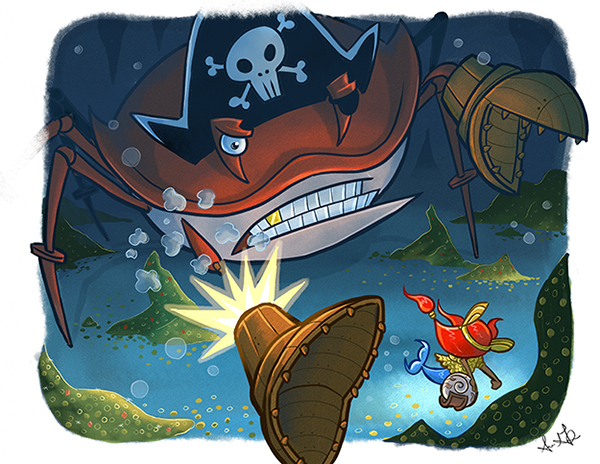 Sneak Peek of a Pirate Crab Boss Fight! Here’s a brief snippet of Athena’s showdown with a giant pirate crab. The fight will take place on different stages — one of which is underwater (as shown here) but the other will have the water drained out so Athena will fight while mounted on her noble froggy steed. All in all it promises for an epic boss fight, which we at Sky Tyrannosaur particularly love to make! Also it shoots laser beams out of its mouth. Because reasons.